Mr CTC and I often have to travel from Up North, where we live, to Down South, where our families live. One of our favourite ways of avoiding the hell of the M1 is travel on the A5 from Daventry to Towcester. Sometimes, we set off a little early, so that we can stop off at the little known oasis of The Heart of the Shires. This is a beautiful little shopping village housed in some renovated stable buildings around a sunny courtyard. The shops include clothing boutiques, a wedding outfitters, antiques, a gardener's paradise, a kitchenware shop where I could spend thousands, and Darlington's Tea Room. Darlington's is one of those tea rooms where the menu includes everything you could ever dream of for lunch or tea. Baked potatoes, salads, quiches, soups, toasties, all sorts of tea, and even cocktails. 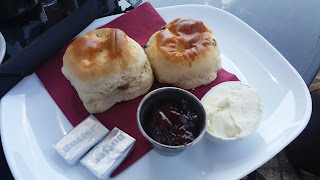 And of course, they do a cream tea. And of course, that's what we had. We sat outside in the sun with the dog, and very soon the tea (Earl Grey for me, Yorkshire for him) came...but, oh dear. Things were not off to a good start with the British Rail-style metal teapots. No matter how you pour them, they always spill half the tea on the table. And you always end up burning your hand if you accidentally touch them while reaching for something else. 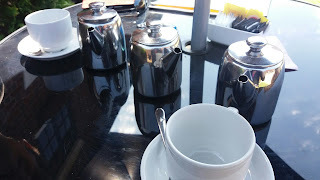 However, we were provided with a pot of spare hot water, which is always a welcome inclusion in a cream tea. Then the scones came, and ah, what a relief! The scones were large, fruited and warm. Tick, tick, tick. And there were two of them. Double tick. They were freshly baked, and delicious. They had that slight-tinge-of-baking-powder taste that I think really makes scones taste homemade (in a good way). Also, we were delighted to see that the jam and cream (clotted, of course) were served in little open pots, just how we like it. The metal teapot mistake was forgiven. The trouble with two scones and a finite amount of jam and cream is that you have to ration your spreads, in order to ensure that you have enough to cover four sides of scone, which sometimes means you start off being stingy on your first scone and then have too much for your second! I guess it just takes practice! The lovely scones and the perfect jam and cream were a big hit, and Darlington's is rapidly becoming one of our 'lets just make a little detour there, even though it's 30 miles away' places, where you can rely on a high quality cream tea. My husband and I are crazy about cream teas. We love them. Even our wedding breakfast was a cream tea. We have cream tea at every opportunity we can, which ends up being most weekends, and sometimes during the week. We like to think that we know a good one from a not so good one, so we wanted to share our love of the best ones around.